I think the Oral-B Pro 3 3000 walks a good balance between the budget range and more expensive electric toothbrushes. The travel case and improved battery life of 2 weeks means the Oral-B Pro 3 3000 represents good value for money. This post has been updated in November 2017 to reflect the new Oral-B Pro 3 3000 electric toothbrush with updated battery life. 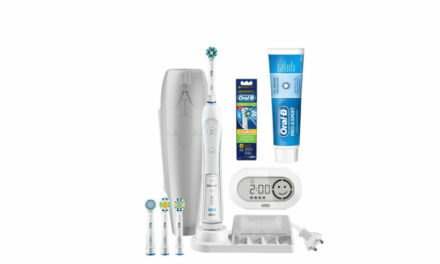 The “old version” is called the Oral-B Pro 3000 and does not feature the updated battery life and the travel case so would not recommend purchasing it. N.B. If you want to find out more about my recommended electric toothbrush list, click here. 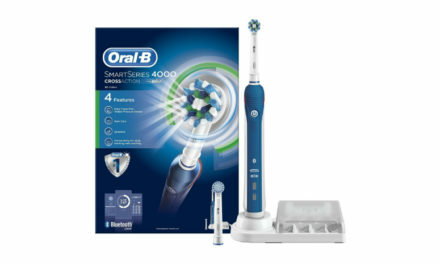 The Oral-B Pro 3 3000 Electric Toothbrush sits between the Oral-B Pro 2 2000 and Oral-B Smart 4 4000 in the Oral-B line up. Both the Oral-B Pro 2000 and Oral-B Smart 4 4000 received great reviews from me so can the Oral-B Pro 3 3000 live up to the expectations? 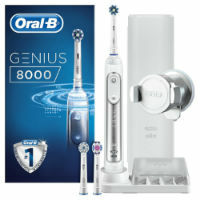 The Oral-B Pro 3 3000 comes ram packed with features for a cheap mid-range electric toothbrush. It has a quadpacer two minute timer which is an on handle timer that “buzzes” every 30 seconds to indicate when you should be changing areas of your mouth. When you have brushed for 2 minutes, it will double “buzz”. This lets you know when you have brushed for the dentist recommended 2 minutes. The Oral-B Pro 3 3000 has a red indicator pressure sensor located on the rear of the toothbrush, which flashes red every time you press too hard . It is easy to see, simple and reliable in design. Pressing too firmly with an electric toothbrush can lead to toothbrush abrasion. Toothbrush abrasion is where the bristles of the toothbrush start wearing down the enamel of the tooth which can ultimately lead to gum recession and sensitivity. The Oral-B Pro 3 3000 handle has a slimline profile which makes it easy to hold. It also has a rubberised texture which makes the handle grippy even when wet. As with most electric toothbrushes the Oral-B Pro 3 3000 is waterproof which means that you can use it in the shower, if you so wish. The Oral-B Pro 3 3000 Crossaction Electric toothbrush uses the standard Oral-B 3D oscillating rotating motion. On daily clean mode the Pro 3000 oscillates 8,800 and 40,000 pulsations per minute. There is significant evidence that this motion cleans better than a manual toothbrush. Also it has been proven that the rotating oscillating motion cleans better than the philips sonicare motion. 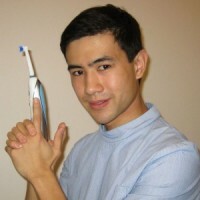 It comes with a cross action brush head which happens to be my favourite Oral-B Brush head. The reason for this is the cross action brush heads have a small diameter which means they can access even the most difficult of wisdom teeth. Also the bristles have been specially angled to clean along the gum line which is frequently missed when brushing. The Oral-B Pro 3 3000 also comes with a spare 3D white brush head. I am not a fan of this brush head as it can be too aggressive on the tooth. Like almost all Oral-B electric toothbrushes (apart from the Oral-B Pulsonic), the Oral-B Pro 3 3000 is compatible with all Oral-B Brush heads. This includes my favourites the Oral-B CrossAction, the Oral-B Sensitive and the Oral-B Ortho Essentials brush head. The Pro-3000 also comes with 3 cleaning modes: Daily clean, Sensitive and Gum care mode. The daily clean is for everyday use and is the most popular of the modes. Sensitive mode is for people with sensitive teeth and is lighter than the daily clean. Gum care mode gently stimulates the gums. To be honest I personally just keep the brush in daily clean mode however can see the real benefit of sensitive cleaning mode for people with dentine hypersensitivity or press too firmly with the toothbrush. 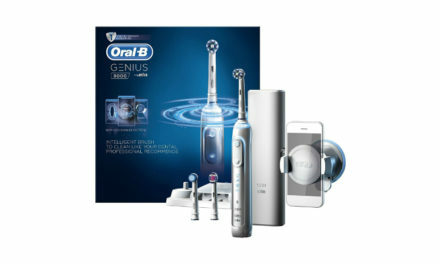 The Oral-B Pro 3 3000 comes with a new upgraded Lithium Ion battery which allows the electric toothbrush to last 2 weeks. This means that it will last for 56 minutes of use, which is 2 minutes twice a day for two weeks. This is a massive upgrade from the old version Oral-B Pro 3000 whose battery lasts 1 week however not quite on par with thePhilips Sonicare brush which can last up to 3 weeks. The charging station on the Oral-B Pro 3 3000 has been downgraded from the old version Oral-B Pro 3000. It used to be able to hold an additional two brush heads however this feature has been removed on this model. The charging station does still hold the electric toothbrush handle upright, keeping it away from grubby stains. As with all the Oral-B charging stations, the Oral-B Pro 3 3000 charging station comes with a 2 pin plug. This means that unless you have a shaving plug in your bathroom, you will need a 2 pin to 3 pin adaptor. A cheap one can be bought from Amazon or any decent hardware store. The Pro 3000 handle weighs 124g without a handle. This is light enough to easily carry around with you on your holidays. The Oral-B Pro 3 3000 now comes with a travel case which is a massive boost. I had often wondered why the cheaper Oral-B Pro 2 2500 came with a travel case and the Oral-B Pro 3000 did not. However Oral-B has now corrected this and the Oral-B Pro 3 3000 comes with a travel case. 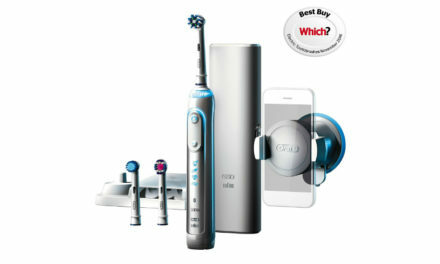 At £49.19 this electric toothbrush represents good value for money. It is debatable whether the Oral-B Pro 3 3000 represents better value for money than the Oral-B Pro 2 2500 or Oral-B Pro 2 2000. To answer this, I compared these three electric toothbrushes here. I have written a list of recommended electric toothbrushes for you here. Is the Oral-B Pro 3 3000 suitable for kids? The Oral-B Pro 3 3000 has not been designed specifically for children. If you want to find a good electric toothbrush for children click here. How do you changes cleaning modes using the Oral-B Pro 3 3000? If you press the on/off switch once it will go to daily clean mode, the second push of the button will go to the sensitive mode, the third push will go to gum care mode and the fourth will turn the electric toothbrush completely off. Do I have to buy an adaptor for the charging station? Yes you will have to buy a shaving adaptor (2 pin to 3 pin adaptor) if you do not have a shaving plug in your bathroom. Is the Oral-B Pro 3 3000 waterproof? Yes it is most certainly waterproof and it can be used in the shower if you so wish. Which is better between the Oral-B Pro 2 2000, 2 2500 and 3 3000? I have written just the article for you here. Can you use the electric toothbrush handle for multiple people (with different brush heads of course)? Yes you can do this and would recommend you do so if you are looking to save those pennies. My fiance and I do this. Does the Oral-B Pro 3 3000 come with a travel case? The Oral-B Pro 3 3000 now does come with a travel case similar to the Oral-B Pro 2 2500. Can the Oral-B Pro 3 3000 be used on crowns/bridge/implants? Yes it is perfectly safe to use this electric toothbrush on crowns, bridges or implants. If your crown, bridge or implant came off whilst using the Oral-B Pro 3 3000 it is likely that they would have come off anyway. Does the Oral-B Pro 3 3000 whiten your teeth? The Oral-B Pro 3 3000 will remove stain to make your teeth appear whiter. The only substances that whiten your teeth are carbamide peroxide or hydrogen peroxide both of which are illegal to sell over the counter in the UK in concentrations high enough to actually whiten your teeth. If you are interested in getting your teeth whitened go seek advice from your dentist and get it done professionally. So really the question is would I recommend this toothbrush, yes I would. I think the Oral-B Pro 3 3000 Electric Toothbrush walks a good balance between the budget range and more expensive electric toothbrushes. The upgraded charging station and the 2 x refills of cross action brush head make the Oral-B Pro 3 3000 represent good value. Summary I think the Oral-B Pro 3 3000 walks a good balance between the budget range and more expensive electric toothbrushes. The travel case and improved battery life of 2 weeks means the Oral-B Pro 3 3000 represents good value for money.